Come Sundown is a long book. 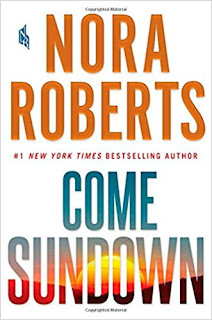 Normally when I am reading a Nora Roberts book, I dread looking at the little number marking what percentage of the book I have left, knowing that I was getting closer and closer to being finished with it, saying goodbye to the characters that had become my friends. This time, however, it felt like the page count was going backwards. No matter how much I read, I wasn't getting anywhere. It took me far too long to even care about the main characters that I'm not even sure why I kept reading it. My favorite parts all involved Alice, and for the first half of the book those scenes were few and far between. Her captivity and her slow descent to madness was interesting--as was her road to healing. My biggest issue is that the wrong characters were the main couple. I didn't really feel much of anything for either Bodine--seriously where does she come up with some of these names?--or Callen, but I did for Chase and Jessica, Bo's older brother and the resort's Events' Coordinator. It was their relationship that I was invested in and wanted more of them. Unfortunately, they were relegated to subplot status with most of the relationship happening off screen. I also found the book to be predictable. I figured out all of the major plot points long before they happened, and so wasn't surprised by much of anything that happened. I was only wrong about one thing and even that wasn't too far from what I thought would happen. The biggest give-away for me was the name given to the secondary villain, the one responsible for the contemporary murders. The final thing that bothered me about this book was that the main villain (the one who took Alice and held her captive for 25 years) was nothing more than a mishmash of the worst characteristics of modern conservatives. He hated "the gays" and black people, both of which he believed were working with the government to take his land and his guns, which he stockpiled for that eventuality. He believed that women were nothing more than broodmares, meant to give him sons because daughters were worthless. This guy was the boogieman--a liberal's nightmare. Well, this liberal didn't buy it. Real conservatives aren't a mix of Cliven Bundy, Adolf Hitler, and Gary Michael Heidnik. They aren't inherently evil and this representation of conservative characteristics is irresponsible.